Amberside ALP (“Amberside” or “ALP”) is raising up to £6 million to lend to Sterling Suffolk Limited (“SSL”) in the form of secured asset-backed bonds (“S1 Bonds”). This is a fixed-term bond, with a planned maturity date of 31 January 2022. Investors can choose to have interest paid half yearly (effective rate of 8.25% p.a.) or to have the interest rolled up (effective rate of 8.5% p.a.) and paid at the end of the bond period alongside the capital. Interest and capital repayment are not guaranteed. SSL has built a gigantic greenhouse in Suffolk – the size of 12 international football pitches. It is used to grow tomatoes hydroponically (i.e. without soil) all year round. The first crop was planted just before Christmas and has been harvested at the end of February. Within 12 months, around 150 million tomatoes should be produced and packed ready to land on our dinner tables. SSL, has a rolling contract with one of the leading distributors of fresh produce to various supermarkets. 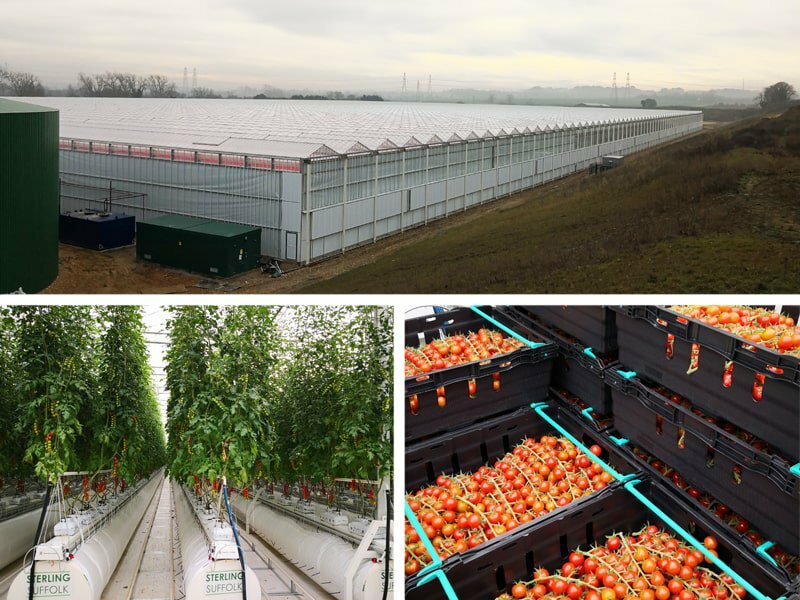 The greenhouse – and the whole operation, a £15 million project – is being largely funded by private investors, through a combination of equity and debt. The equity element was funded via the Sterling Suffolk EIS, which is fully subscribed and now closed. It is still possible to invest in the debt part through the Sterling Suffolk S1 Bonds. The bonds are managed by Amberside ALP, whose team has invested in – or advised on – infrastructure projects worth around £5.5 billion. Rates are not guaranteed. Any interest you receive is normally subject to income tax. Please note: if you invest through an ISA any interest will be tax free. Please remember tax rules can change and benefits depend on circumstances. Interest is calculated six-monthly. For the S01 tranche the half year interest rate is 4.1634% compounded on each rollover date giving an effective annual interest rate of 8.5%. For the S02 tranche the half year interest rate is 4.125%. Every day the world population grows by 200,000 people. All of them need feeding. By 2030, farmland per capita is likely to decrease from 2,200m² to 1800m². Hydroponics could help bridge this gap between demand and supply. It is an established method of growing plants in sand, gravel or liquid, using mineral nutrient solutions but without soil. Using hydroponics has both environmental and health benefits. By eliminating soil there are no soil-borne pests or disease, so fewer pesticides are required compared to traditional farming. This, in turn, helps reduce soil erosion as well as air and water pollution. Crops can be grown virtually anywhere, lowering transport emissions and providing consumers with fresher goods. Food currently travels an average of 1,500 miles before reaching our plates. Moreover, as the plant receives optimum nutrition throughout its growth, the resulting crops have superior taste and higher nutrients. The global hydroponics market is anticipated to grow to US $724.87 million by 2023. Improved yields, higher return on investment, and protected environment among others, are helping attract producers as well as investors. Europe is the fastest-growing region, forecast to grow 16% a year, with the Netherlands and Spain leading the way. In the UK, the market is still developing and is currently quite fragmented. How will SSL use the funds? SSL has funded the development of its facilities with the issue of circa £5 million of equity and £10 million of senior debt. The senior debt was provided based on SSL demonstrating a forecast debt service cover ratio of 1.5x. This ratio means that the base case business plan, as approved by the Lending Team, shows SSL should generate 50% more cash than it needs to service the debt that ALP provides. Capital raised by the issue of the new S1 Bonds will be employed to repay or refinance the senior debt (more details in the Information Memorandum). A further 2.7-hectare extension is planned using debt provided by ALP. What protection do bondholders have? S1 bondholders will rank pari passu with other bondholders and have an equal claim to the security package ALP holds with SSL. The security package includes a first charge over all SSL assets. SSL owns significant assets and also the potential for generating relatively predictable cash flow over a protracted period. However please note the S1 bondholders will only be lending to SSL. There will be no diversification. Please also note this bond is not covered by the Financial Services Compensation Scheme for deposits. What are the Debt Covenants? This means that, excluding refinances, the amount of money generated in a year by SSL after costs should always be at least 1.5x (150%) of the debt payment (interest and capital). This means that at no point should the loan value be more than 75% of the valuation of SSL. This means that SSL must retain in cash the amount needed for the next 6 months’ worth of debt payments (interest and capital). It should be noted that there are no capital repayments until the ALP debt is refinanced, cash is retained in the business to build a buffer to assist the refinance. What experience does the manager have? Amberside is a recently established company set up to raise £30 million to be deployed into three to five opportunities of which SSL is one. It is concentrating on a segment of the market which it believes to be currently underserved: projects below £20 million which are usually too small for banks and insurance companies’ project finance teams and too big for asset-backed lending providers. The lending team consists of Amberside and CH-1. Amberside has managed investments of over £2 billion in infrastructure, solar, commercial property and UK asset-backed lending in the last 15 years. Amberside Advisors has been mandated on close to £5 billion of infrastructure debt. CH-1 has invested £0.5 billion directly in infrastructure projects on behalf of high net worth investors. No matured debt investments made by CH-1 have so far suffered any loss of capital or interest to investors, although please remember past performance is not a guide to the future. Amberside ALP’sinvestment committee must approve each investment before money is released and review all projects every 6 months to ensured there is no material change that could impact the credit. In addition, models are updated prior to all drawdowns to ensure covenants are met and there have been no material changes following credit approval. All projects are subject to full due diligence. Bonds such as these are not readily realisable. They tend to be illiquid and hard to sell and value. They should only form part of a balanced portfolio and you should not invest money you cannot afford to lose. Before you invest, please carefully read the Risks and Commitments and the offer documents to ensure you fully understand the risks. Tax rules can change and benefits depend on circumstances. As with all bonds of this type they are not covered by the Financial Services Compensation Scheme for deposits. The S1 bonds are technically transferable, however, there is no secondary market, so investors should assume they will need to be held for the full term. If you invest in the S01 tranche, interest is rolled up and not paid out until redemption. So, if you invest in the Bond in March you will wait until January 2022 before you get anything back. This is a single company bond offer with no diversification. It involves lending to one company only. Should that company not perform as planned repayment to the bondholders may be impacted. Amberside ALP will receive fees from the borrowers. It will pay Wealth Club commission of 1% p.a. of out of these charges. There is no arrangement fee between SSL and ALP, although SSL will pay for due diligence costs. Amberside Capital and CH-1 Investment partners will receive fees from Amberside ALP by taking a fee from the spread following a successful payment of interest from SSL. This fee is capped and subject to capital requirements in ALP being achieved. Please see the Bond Offer Document for more details of the charges. This asset-backed bond offers a good rate of interest and gives investors a choice between having the interest compounded and paid at maturity (planned for 31 January 2022) or paid twice a year. Despite the sheer scale and relative complexity of the project, SSL has so far met all its milestones on time and on budget. The greenhouse is an impressive structure. The first crop was planted in December 2018 and harvested in February 2019, ready to be packaged. We are comforted by the distribution supply agreement. Debt will be drawn down in accordance with key milestones being achieved. There is only one company so there is no diversification which adds to the risk, although the interest rate reflects this. For experienced investors, this could be an interesting opportunity.